Ever wonder about the white cheese featured in Alaska Airlines’ Signature Fruit and Cheese Platter, and where you can get it? This is how a Seattle shop began selling 100,000 pounds of locally-made cheese to Alaska every year. What was Seattle missing before 2002? According to Beecher’s Handmade Cheese founder Kurt Beecher Dammeier, a hometown artisan cheese shop. Which was the void Dammeier aimed to fill when he acquired a space at Pike Place Market in 2002. “I didn’t even know if it was legal to make cheese there when I bought the place,” Dammeier said. About a year later, he opened Beecher’s and nearly every day since, the corner store has been full of locals and tourists enjoying everything from cheese curds to rich and comforting mac and cheese. Dammeier was committed to making quality cheese before he knew what it would take to make cheese. At first, he thought he was going to make the cheese himself with some fellow co-workers. “After a three hour class, I realized I couldn’t make cheese and needed to hire a professional cheese maker,” Dammeier said. The first cheese Beecher’s produced, which is still its most popular, is the Flagship. For inspiration, Dammeier says he tried every cheese sold in Seattle and decided what he wanted Beecher’s flagship product to be. Dammeier’s ultimate goal was to create a “cheddar with Swiss overtones that would be less acidic and easier to cook with than a cheddar or Gruyère.” He wanted to introduce people to a high-quality, flavorful cheese product that the average person, not just a cheese-lover, would enjoy. Alaska Airlines’ food and beverage team loved Beecher’s Flagship cheese so much, they decided to feature it on almost every Alaska flight. “Our philosophy and goal was to make our Signature Fruit and Cheese plate more local. Why would we import cheese when we have a great cheese company right here in Seattle?” said Kirsten Robinett, manager of onboard food and beverage for Alaska. Alaska wanted to feature a premium cheese, like Beecher’s, on board for a month. Eight years later, Beecher’s is still served on every fruit and cheese platter the airline serves, along with Tillamook Cheddar of Oregon and a wedge of brie. Every day Beecher’s takes delivery of 40,000 pounds of fresh, local milk, which is then pasteurized and pumped into a vat to start the cheese making process. First, the milk is heated for pasteurization and cooled to 89 degrees. 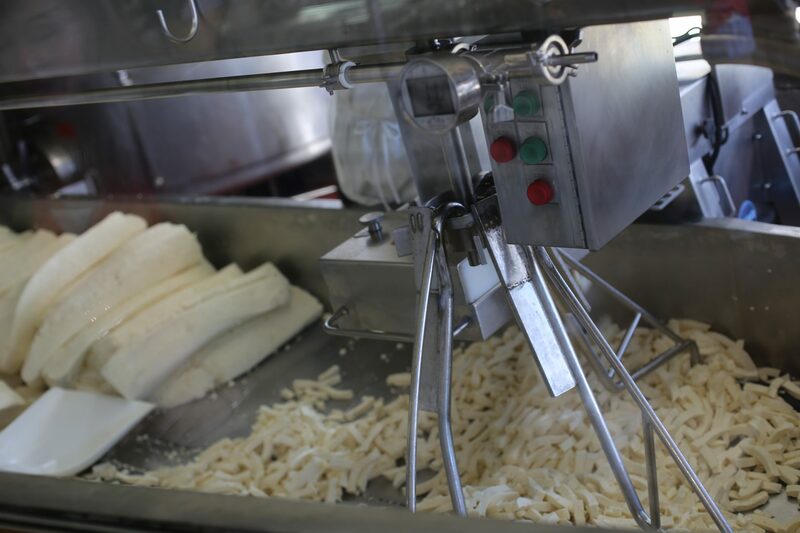 Then it fills a large metal vat, where special ingredients are added causing clumps which help form curds. From there, the curds are cut into cubes, releasing the liquid whey, which is the liquid left over after the milk begins to form into curds. After the whey is drained, the curds are pressed and cut into loaves to squeeze out more whey. Salt is added for flavor and the curds are placed into molds called hoops. After the whey is drained from the curds, the cubes are cut into smaller pieces before heading into storage. Beecher’s holds itself to the highest food standards, and meets the British Retail Consortium certification. “This is the most stringent food safety certification available. It proves that you are controlling your outcomes and is an important outside certification,” Dammeier said. In the beginning, Beecher’s made one vat of cheese, three times per week, with 1,000 pounds of cheese produced in each batch. Today, Beecher’s makes four vats per day, seven days a week or 28,000 pounds per week. Today, the shop makes 20 varieties of cheese products, with Flagship being the original and most popular cheese sold. Once the cheese has aged, it is packaged and shipped to shops around the country and onto Alaska Airlines flights. With over 127,000 cheese platters served per month on Alaska Airlines, chances are if you have flown on Alaska, you have tried the fruit and cheese plate served on board. The platter features products from around the Northwest like a Seattle Chocolates Dark Chocolate San Juan Sea Salt Truffle and Partners crackers alongside two slices of Beecher’s Flagship. Travelers can reserve food, including fruit and cheese platters in advance, beginning one week before a flight up to 12 hours before a flight, using the Alaska Airlines mobile app. 7 comments on "The art of an artisan cheese plate"
Beecher’s cheese is the best. I order the cheese and fruit plate when I fly to Seattle and back to Palm Slrings. Love love love it. Love the signature fruit and cheese platter but I always find there are too few crackers for the amount of cheese! Any way to add a couple more crackers or trade the brie for some more Beecher’s 🙂 ? The Cheese and Fruit plate is the best food that has been offered on any airline since my early days of flying with Pan Am. I would love to see it offered on shorter flights of ANY duration. Thank you for offering a healthy, tasty, quality, satisfying and local food item. I love the fruit and cheese platter. But it is usually sold out about halfway through the jet. Yes the cheese plate is fantastic. I order it almost everytime. I miss getting salmon for dinner like i had in the 90’s even in economy class. You can’t get it even in first class with your bagel. beyond the chesse plate it;s unhealthy disgusting stuff like chicken. and who cares who dreamed up the receipe.